A friend from a project started over 15 years ago, pointed me at the Libre Hosters gathering in Amsterdam so, I thought, hey! that sounds interesting. I joined the irc chat room, and before long booked tickets to Amsterdam. Travelling by Eurostar would have been fun, but sadly it was twice the price, and would have took an extra day of travelling, which wasn’t available, so a return on KLM to Schipol was organised. The chat went on until after midnight, eventually I gave up and went to sleep around 2am. Ten groups presented brief introductions of themselves. They represented quite a variety of organisations, some more established, others nascent, some more active, some more dormant. It was great to hear about the different organisations and there see what services and processes they were using. Framasoft, one of the initiators of the Chatons project sees itself not as a tech project, because tech is too complicated! It prefers to see itself as a project to “empower the commons” whilst providing a number of of decentralised hosting services for it’s members. Framasoft is relatively big project, employing a number of paid workers. It’s difficult to build systems that are truly decentralised, especially when the groups and organisations within them have very different capacities, one of the key issues that was mentioned from Chatons and Framasoft was how to prevent organisations with greater capacity and resources becoming more “centred” within networks. After the introductions with from the organisations a complicated conversation occurred around definitions of a librehosting organisation and what types of content should or could be carried by a librehoster. 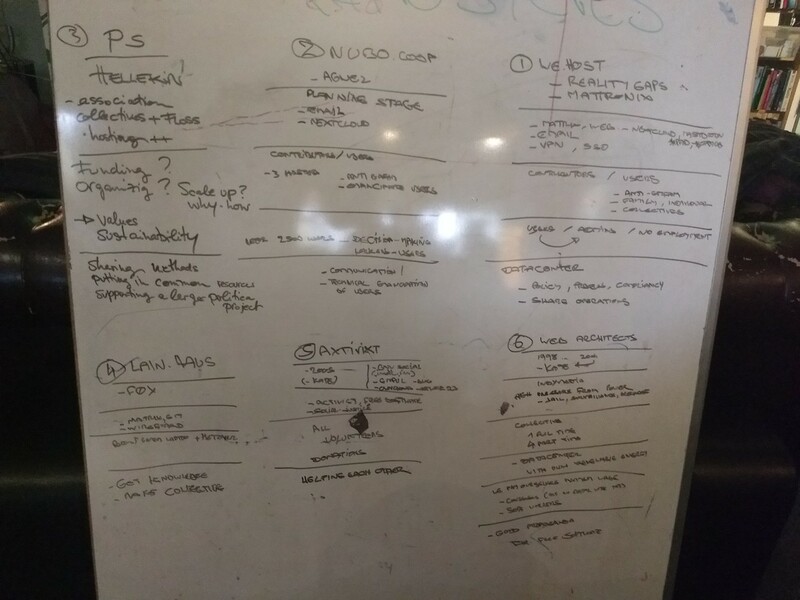 This was a quite a difficult discussion, as we tried to get an idea of what would be “allowed speech” and how “federation” such as in protocols such as Matrix or ActivityPub affect hosting providers. 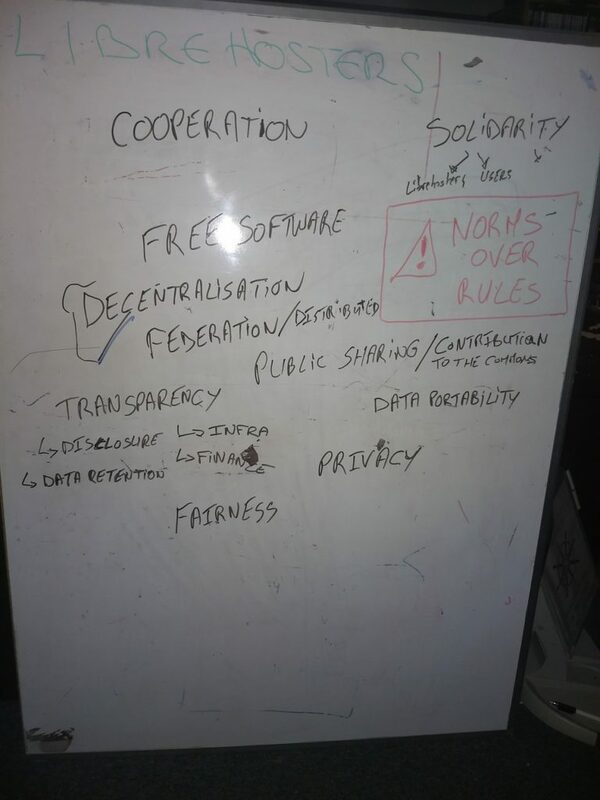 After several hours of back and forth around the subject a consensus started that, rather than defining what was allowed, an agreement around shared norms and values of a librehosters would be better place to define the network at this point. Fuelled by a feeling of success and collaboration, the libreho.st was purchased, and quickly the infrastructure required for a domain (DNS, email, and web hosting) was put together, distributed across the participating organisations. 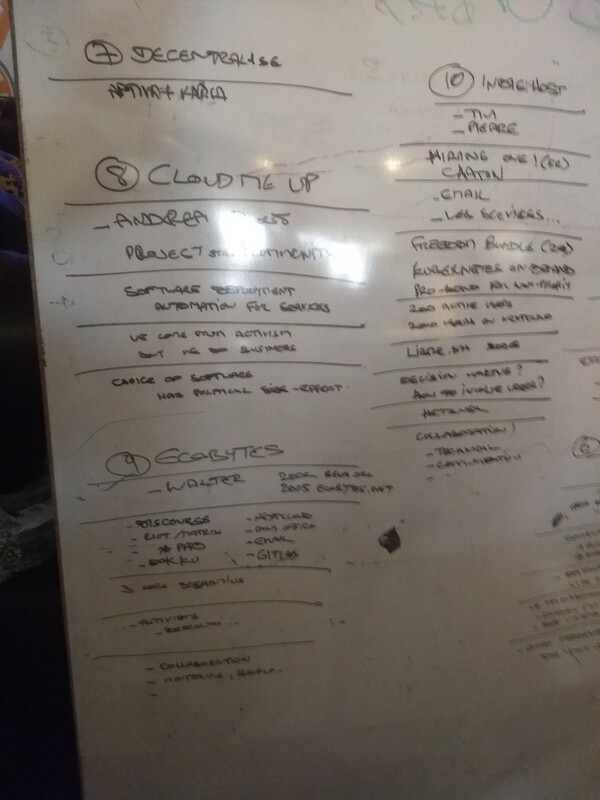 practical work on implementing services on top of the domain. A minimum of a gitlab service, a discourse forum, and a keycloak federated login service. The governance discussion was important, but in the end did not result in the production of a formal process. However there was a clear understanding that face to face meetings would have a priority over discourse, and discourse over matrix/irc chat when it came to any conflict resolution. So to sum up… 3 days of conversations and hacking, contacts and friends made across Europe, and fine start to grow some collaboration on. A great Monday morning read. Solid stuff!!! We now have SSO (single sign on) working from git.coop to the Libreho.st Discourse forum and Libreho.st GitLab — this means if you are logged into git.coop you can click through to login to these other sites.